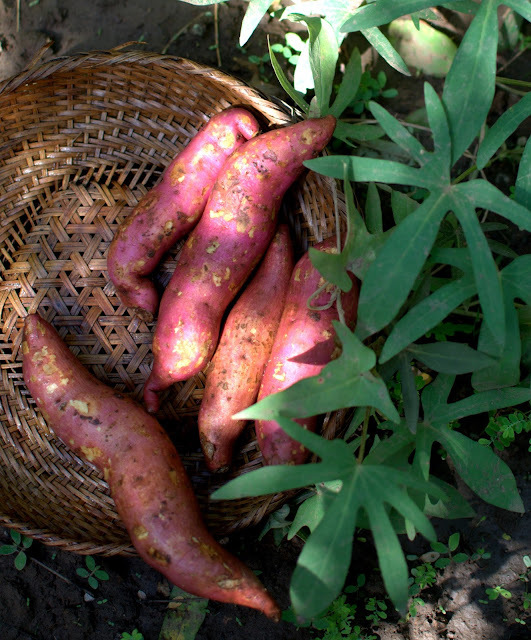 I bought some nice and plump pink skinned sweet potatoes a few weeks ago, first lot of this season as I can't wait for the sweet potatoes from my garden. The leaves are getting lush and spreading like wild fire now, I use the sweet potato leaves to make a stir fry and add them to my besan cheela sometimes, but the tubers have a charm few can resist. I make many interesting salads using sweet potatoes. This carrots and sweet potato salad has become a favourite since I cooked it on a farm by instinct, and this sweet potato and beets salad is another favourite. 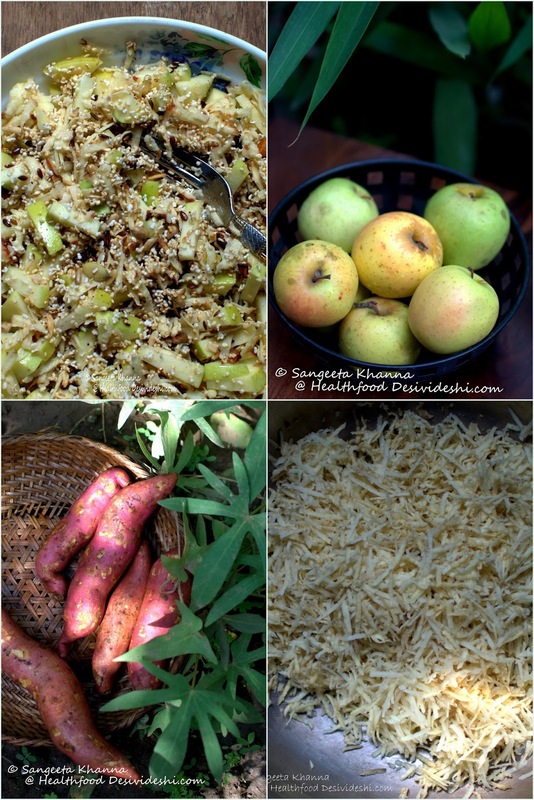 Sweet potato and water chestnuts both have the same season so it makes sense to combine them for salads too. You would love this sweet potato pudding we call shakarkand ki rabdi, a dessert made without sugar. This season I made a shakarakand ka halwa for Diwali special of my Down to Earth column and the rest of the sweet potato was grated to have fun with it. I instantly posted the picture on instagram it looked so pretty. The grated sweet potatoes helped me make a gluten free breakfast on a weekend. It was quick yet delicious sweet potato hash browns made in almost one batch on my dosa griddle. Luckily October has finally brought some cheer and we are enjoying our weekend breakfasts in the garden. Some tea was brewed, eggs were fried and jars or peanut butter and Apricot chutney were brought out. The sweet potato hash browns were so delicious we did not need the peanut butter. The Apricot chutney suited really well with the porous hash browns that held together beautifully, thanks to the rice flour I used for binding. Mix all the ingredients together and let it rest for 5 minutes till the griddle heats up. 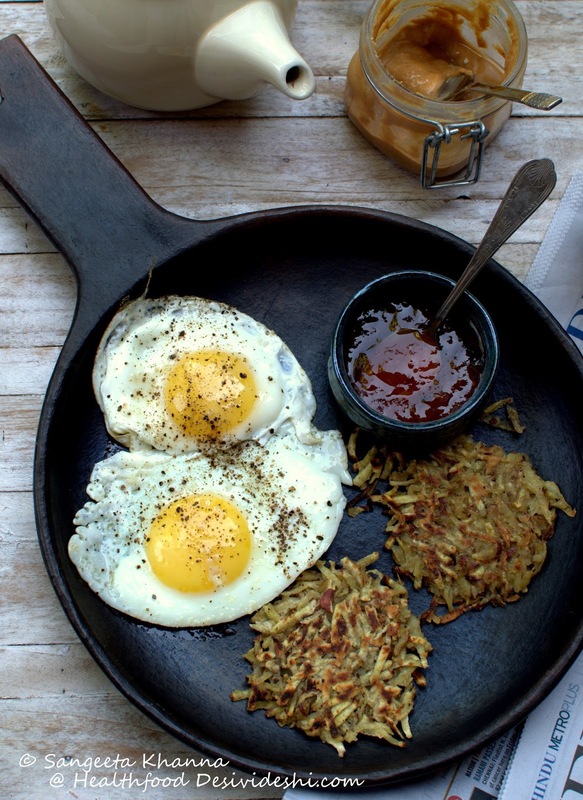 I used my cast iron dosa griddle and made all the hash browns in 2 batches. Using your fingers, lift a handful of the grated sweet potato mix and spread over the greased hot griddle and flatten it using a spatula. Drizzle ghee to let it brown on one side. Flip and let it brown on the other side too, some crispness sis desired here so cook till you feel it is good for you. Make your tea and fried eggs on the other side and serve immediately. Next time I am going to serve these with some sour cream or a quark dip. 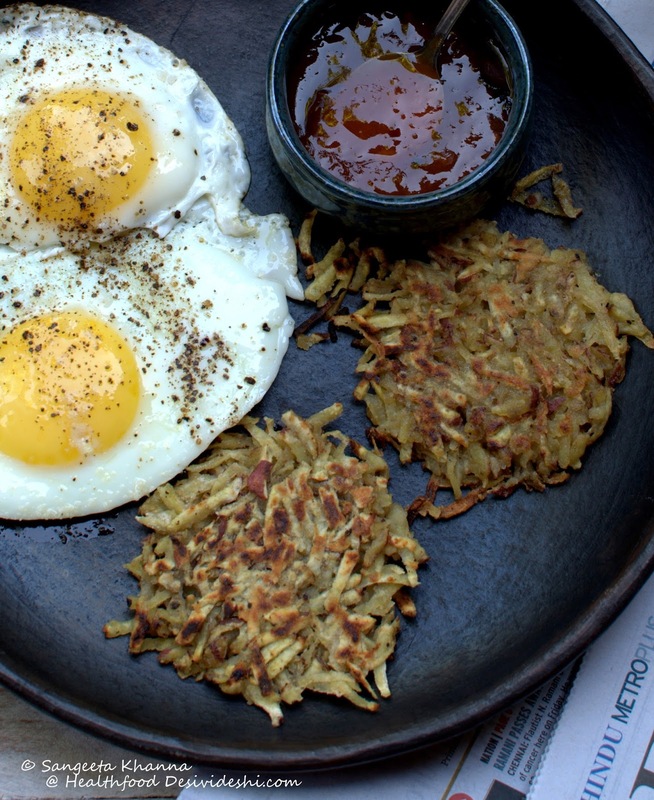 These sweet potato hash browns were so crisp they can be served as canapes. Adding buckwheat flour makes these hash browns as crisp as the rice flour version but take care not to add too much flour. The hash browns are crisp on the outside with a soft center though you can bake them to more crisp texture. I had some more grated sweet potatoes so I mixed it with some lime juice, dash of balsamic and honey and refrigerated it planning to make a salad next day. I love raw sweet potatoes and this salad was intended to be made along with some mung sprouts. But the next day I felt like a fruity salad for lunch and tossed up this slaw salad along with some finely shopped green apple and a popped amaranth and mixed seeds trail mix. Mung sprouts would have tasted great too but after adding one whole apple it became a good quantity for my lunch, hence the sprouts were dropped. 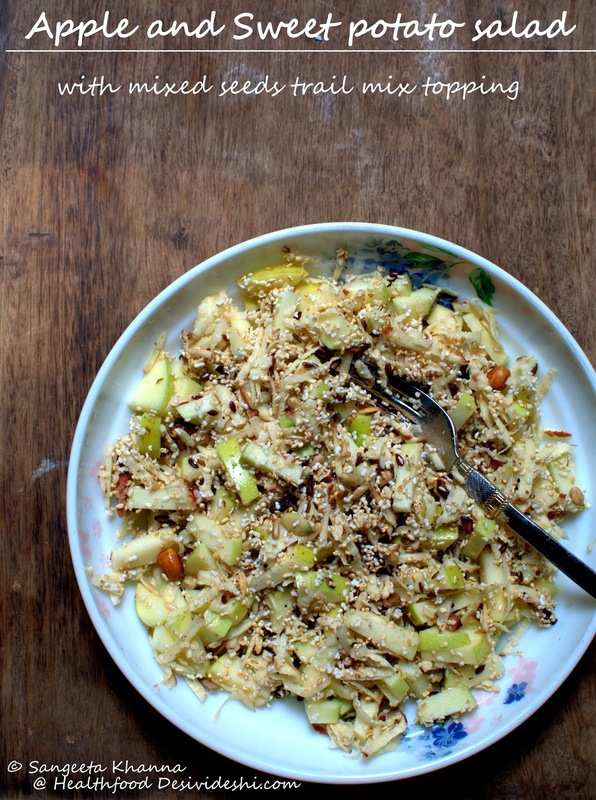 I was not planning to share this salad on the blog but I liked it a lot and clicked pictures. You could add any roasted seeds mix to it and get a good crunch in it too. This apple and sweet potato slaw is a salad that can be made as a meal, as a sandwich filling or even as a topping for canapes. Thee is nothing special in this salad but do take care to let the sweet potato seep into the lime-balsamic-honey dressing for a few hours before tossing up the salad. Add the chopped apples, the trail mix and some EVOO, toss and serve immediately. I may not add EVOO next time I make it but you can go with what you like. Hope seasonal produce inspires you too to cook something new every season and you keep reinventing the same old food in new ways. It does bring some cheer every season trust me. I hope these recipes will be useful for those who are fasting for Navratri too. Those hashbrowns look yummy, Sangeetha. What does 'scant' mean? 'scant' 2 cups means barely full 2 cups or loosely packed. It is difficult to measure volume of a grated or chopped vegetable as one might pack it hard or chop or grate it fine, hence using these words to my best understanding. 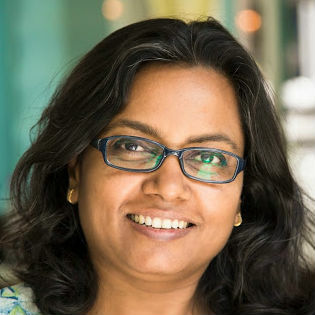 Oh I thought it was a process, Sangeeta. So did you grate these then?